It has been two years since China formally initiated the Lancang-Mekong Cooperation Mechanism. Will it improve multilateral cooperation and ease tensions over development projects as intended? For the group of Tibetan youngsters, it was a rare opportunity to see what life is like on the lower reaches of the river known as the Lancang in China, and the Mekong elsewhere. Hailing from Qinghai Province, near the source of the Lancang, the group was performing and exhibiting Tibetan culture in the Lao capital of Vientiane at the third Youth Innovation Competition on the Lancang-Mekong Region’s Governance and Development (YICMG), which started on January 27. Since 2016, when the first youth exchange took place, more than 100 university students from the six Lancang-Mekong countries of China, Thailand, Laos, Myanmar, Vietnam and Cambodia have participated. Wang Zeyun, media officer from Yushu government in Qinghai Province, which had hosted the previous two events, said it advocates a common theme of “drinking water from the same river and building a community of common destiny,” and it is dedicated to strengthening communication, cooperation and mutual understanding among the young people from the six riparian countries. 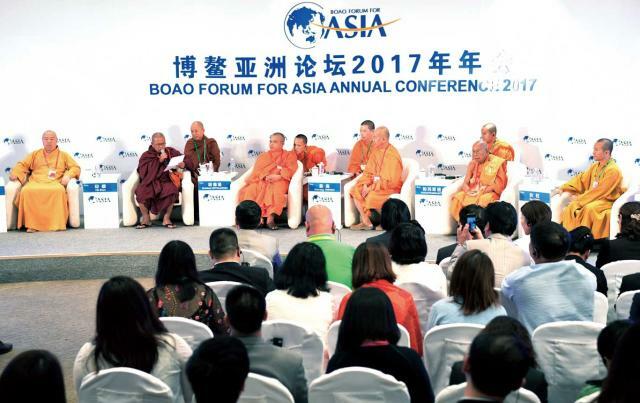 “The event is intended to unite young people’s wisdom and power, and provide support for the sustainable development of the six countries in the Mekong River region,” Wang told NewsChina in late January. It’s a long and arduous journey to the source of the Lancang on the remote Tibet-Qinghai Plateau. In late July 2016 during the first YICMG in Yushu, a participant from Thailand told the reporter that development and innovation were the responsibility of the young generations, and the main force driving cooperation among Lancang-Mekong countries. “We are honored to have the opportunity to come to the very source of the Mekong for the common goal of promoting each country’s development,” he said. The cultural and educational exchange program, sponsored by the Chinese government and organized jointly by the six riparian countries, has been included in the Lancang-Mekong Cooperation (LMC) Framework, an initiative started by China in 2015 to facilitate multilateral cooperation and regional integration. In January 2018, during the second LMC Leaders’ Summit in Cambodia, the event was listed as a model achievement and categorized into an updated list of 132 projects proposed by the six member countries through the LMC Special Fund. The world’s 12th-longest river, with an estimated length of 4,909 kilometers, the Lancang-Mekong meanders from its mountainous source, generally considered to be the Lasagongma Spring in Yushu, until it empties into the South China Sea via the Mekong Delta. Over 60 million people along the river directly depend on the river and its tributaries for food, water and other aspects of their daily lives. It was at the 17th China-ASEAN Summit in November 2014 in Nay Pyi Taw, capital of Myanmar, that Chinese Premier Li Keqiang proposed establishing the Lancang-Mekong cooperation mechanism. The establishment of the LMC was officially declared in November 2015 by the six member states, and the first LMC Leaders’ Meeting was held in South China’s Hainan Province in March 2016. The mechanism identified three pillars of cooperation – political and security issues, economic and sustainable development, and social, cultural and people-to-people exchanges. The five priority areas under the LMC include interconnectivity, industrial capacity, cross-border economy, water resources, agriculture and poverty reduction. At the first LMC Leaders’ Meeting, Li noted the LMC was a useful complement to China-ASEAN cooperation, which helps promote the economic and social development of its members, narrow their development gaps, and upgrade overall cooperation between China and ASEAN – apart from China, the other five members of the LMC are also members of ASEAN – the Association of Southeast Asian Nations. Xu Liping, a senior research fellow at the National Institute of International Strategy under the Chinese Academy of Social Sciences (CASS), said the very formation of the proposal for the LMC mechanism was inspired by some domestic think tanks, which has suggested promoting more interaction among high level officials in the six countries. “The six countries are showing a ‘spaghetti bowl’ phenomenon due to the complexity of bilateral or multilateral cooperation on various levels, so the birth of the LMC is only natural considering it can better exhibit the geographic closeness and stimulate the economic complementary roles among member countries,” Xu told NewsChina in late January. The “spaghetti bowl” effect occurs when the number of trade deals between countries actually slows down trade, instead of boosting it. Before the LMC, China already had strategic partnerships with the other five countries. China is the biggest trading partner of Cambodia, Myanmar, Thailand and Vietnam, and the biggest investor in Cambodia, Laos and Myanmar. According to Chinese government data, in 2015, China’s total trade with the other five member countries reached US$193.9 billion. In early January, ahead of a visit to Cambodia, Li Keqiang wrote a commentary in newspaper The Khmer Times, saying that in the context of a rising backlash against globalization and protectionist sentiments as well as lack of momentum in East Asian cooperation, the LMC as a basic component of regional cooperation is not only conducive to narrowing the development gap within ASEAN and advancing ASEAN integration, but also enriches South-South cooperation and efforts to foster a more open, inclusive and balanced economic globalization that benefits all. Under the LMC framework, China has pledged to provide concessional loans of up to 10 billion yuan (US$1.6b) and credit loans totaling 10 billion yuan to promote industrial capacity cooperation and infrastructure construction within the region. Additionally, China is committed to prioritizing the Mekong area for spending in the South-South cooperation aid fund totaling US$200 million, and to setting up an LMC special fund to provide US$300 million in five years to support small- and medium-sized cooperation projects within the region. During a recent interview with the Xinhua News Agency in December 2017, Hoang Quoc Dung, member of the executive board of the Vietnam Association for Conservation of Nature and Environment also confirmed the positive role of the LMC in the last two years. “Among other significant achievements are the 45 Early Harvest projects which have or are already being implemented,” he said. Construction of the Myitsone Dam in northern Myanmar, a joint project involving Chinese investors, which proved controversial in Myanmar, has been on hold for political and social reasons by the Myanmar government since 2011. The fallout from the suspension has caused a negative impact on both official and non-governmental communications and exchanges between China and Myanmar for some time. Ji Lin, Executive Secretary of the Global Environmental Institute (GEI), a domestic Chinese environmental NGO which has been involved in community engagement and environment preservation projects in the Mekong region since 2005, told NewsChina that communications with Myanmar at the community level had been forced to stop due to the politically sensitive issue of the Myitsone Dam. In 2017, the GEI was appointed by China’s National Development and Reform Committee (NDRC) to implement a South-South cooperation aid fund, which included distribution of solar panels and clean cooking stoves in Myanmar, through its established community channels. The project has had a positive effect. “It is apparent that whether community-level projects can be effectively implemented depends on local peoples’ impression and recognition towards China and its companies,” Ji said. Among all five priority areas under the LMC, water resource management is most important. Historically, as China and the Lower Mekong countries strengthened their efforts on the development of water resources on the waterway, in particular dam construction, the parties are also going through a growing trust crisis due to a lack of mutual negotiation or an overall effective water management mechanism. If there is flooding, or low flow levels due to upstream drought, the six countries find it difficult to share objective information on water flow and enter into quick negotiations. This sometimes means parties resort to a blame game, making the water issue more complicated. An effective water cooperation mechanism is vital to achieve fair and rational solutions to water disputes and combat the negative impact of drought and flood in the lower reaches. The LMC has fostered the setting up of a water resource research center to coordinate among member countries on river flow information sharing and the distribution of water resources. he Mekong River area is a hotspot for various multilateral mechanisms. Apart from the LMC, multilateral mechanisms in various forms have been set up between the lower Mekong states and the US, Japan, South Korea and India, among others. All these mechanisms have been competing against one another. Despite some observers saying that the LMC is a rival to the long-standing MRC, high-level statements from the LMC state that the LMC mechanism is complementary to existing cooperation mechanisms. According to Professor Lu Guangsheng, director of the Institute of Southeast Asian Studies at Yunnan University, all existing mechanisms differ from one another in their basis and focus on different cooperation areas. The LMC stands out in this regard since it is expected to get the biggest input and advance most quickly. “The LMC does not exclude other multilateral mechanisms, but aims to incorporate and complement existing mechanisms to achieve sound regional governance,” wrote researcher Xing Wei from CASS in an article published in the Pacific Journal in June 2016. Dr Anoulak Kittikhoun, Chief Strategy and Partnership Officer of the MRC, admitted to our reporter in a recent email that although the MRC per se is not a party to the LMC framework at this stage, it recognizes the LMC initiative as being one that could cement future cooperation among the six basin countries, and it would certainly bring benefits to reaching the MRC’s goals. Indeed, the MRC has been cooperating with China on hydrological data-sharing since 2002. New cooperation between the MRC and LMC includes a joint study on the hydrological impacts of the Lancang Hydroelectric Cascade on extreme events and, according to Anoulak, the MRC is working on memoranda of understanding with various LMC centers. “Thus, the new framework would present a new opportunity for the MRC to strengthen ties with China and Myanmar, and we believe we could and are ready to contribute to the new regional cooperation with our 23 years of experience,” Anoulak said. The Lancang Cascade includes at least six dams, with more planned and under construction. 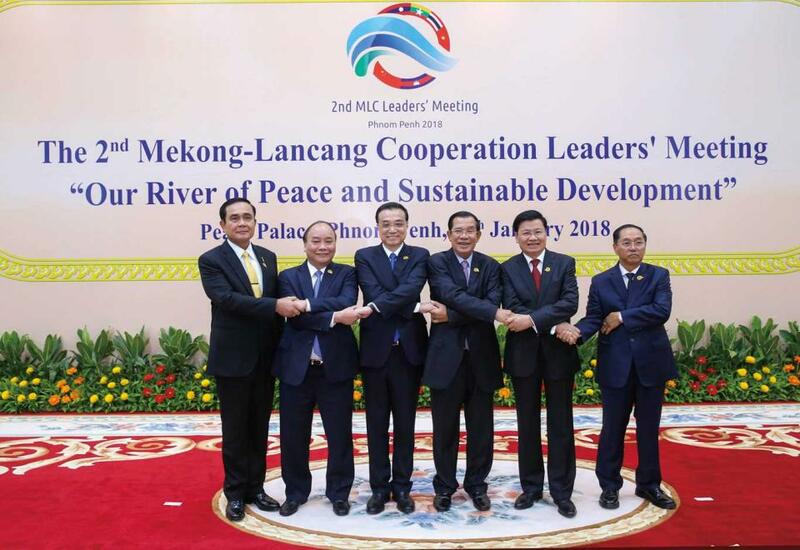 So far, leaders from the six LMC countries have approved the Five-Year Plan of Action of the Lancang-Mekong Cooperation (2018-2022), indicating the mechanism has stepped from transition into maturity with a clear-cut practical action plan. “In the next five years, the key is to tie together the efforts of the six members while avoiding interventions from foreign countries outside the region, pushing forward the mechanism while minimizing impact of political uncertainties in certain transitional countries such as Cambodia, Vietnam and Thailand,” noted Xu.